Write each Sequence of a multisequence FASTA to a separate FASTA file. 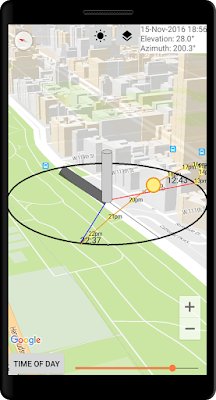 GPS data is requested when you click on "Location from GPS" to use your current location. Absolute none! No data from your device is sent to any servers, no analytics is performed. The data stays on your device, all the calculations are done directly on your device. 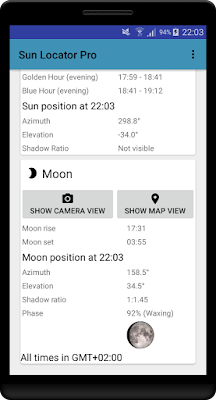 Sun Locator is an Android App to predict the sun and moon position during the course of a day and a year. 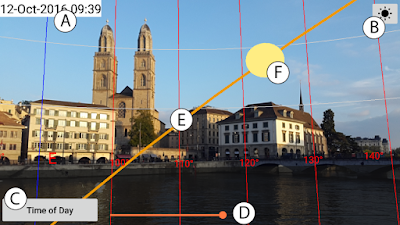 The Camera view (Augmented Reality) displays the solar position and lunar position directly overlaid on your device's camera. 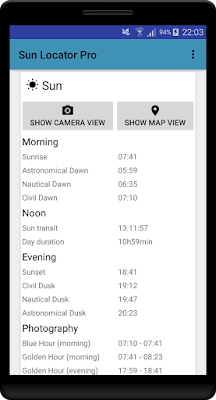 Use the slider to set the time of day or day of year and directly track the solar movement. 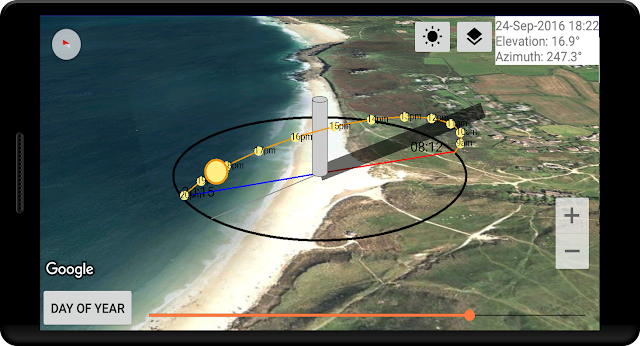 The Map view displays the solar and lunar location, direction and shadow on a map to help you plan your activities. 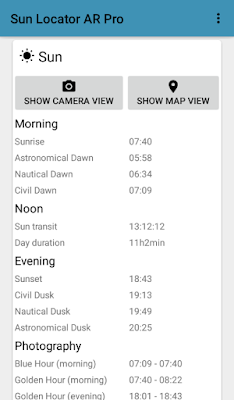 The Main view includes all important information such as sunrise and sunset, twilight, "magic" photography times (blue hour/golden hour), moonrise and moonset, lunar phase etc. Photography: when and where will the sun rise and set? When are the Blue hour and the golden hour? When and where will the moon shine tonight? Gardening: do your plants get enough direct sunlight during the course of the day and year? Real estate: does a neighboring building obstruct the sun and cause shade? Architecture: How much sunshine will your home get? Does the sun shine through your window? Camping: will the sun shine on your tent? Hiking: when does dawn start and dusk end? Solar panels: Will there be nearby obstructions? Sun Locator is available at Google Play. The Lite version is free and limited to information for the current day. The Pro version displays information for any day of the year. The time of day when the sun or moon crosses the Earth's horizon. Sometimes referred to as solar noon, is the time of the day when the sun passes over the observer's meridian line, this is roughly when the sun is at its highest. Civil twilight: Approximately the limit at which solar illumination is sufficient, under clear weather conditions, for terrestrial objects to be clearly distinguished by eye. There is enough light from the sun during this period that artificial sources of light are not needed to carry on most outdoor activities. Nautical twilight: The horizon is clearly visible, but artificial lighting is necessary to see terrestrial objects. Astronomical twilight: Outside of the astronomical twilight, the sky (away from light pollution, moonlight, auroras, and other sources of light in the sky) is dark enough for nearly all astronomical observations. The length of the shadow cast by an object of the height of 1 foot or meter. The Blue hour is the period of twilight when the sun is below the horizon and the indirect sunlight takes on a predominantly blue hue and cold color temperature. The Golden hour is the short period of time just after sunset when the light is redder, having a warm color temperature. Lighting is diffuse and with little contrast, so no strong shadows exist. The horizontal angle clockwise from North. I.e. North is zero degrees (0°), East 90°, South 180° and West 270°. 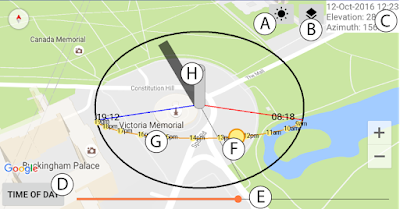 The Magnetic declination is automatically taken into account using the specified location. The percentage of the lit surface of the moon. 0% corresponds to a new moon, 100% to a full moon. The moon is either waxing (the lit surface is increasing) or waning (decreasing). All times are displayed in your current time zone (as set by your device). So if you select a locationof another time zone (e.g. you're in Europe and want to know the sun rise somewhere in the USA), the displayed times correspond to your device's clock. The button "Show Camera view" and "Show map view" opens the Augmented Reality View and Map view, respectively. [A] Date/Time: Use the bottom slider to quickly change the date and time. [B] Switch Sun/Moon: Switch from displaying the Sun position and path to displaying the Moon. 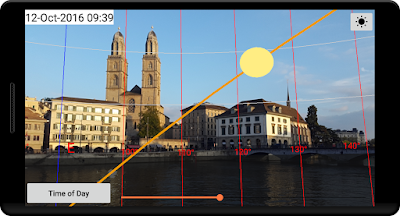 [C] Slider range: Using the slider will either set the time of day or day in year. [D] Slider: set the date and time by going back and forth. [E] Sun/Moon path throughout the day. [A] Switch Sun/Moon: Switch from displaying the Sun position and path to displaying the Moon. [C] Date/Time: Use the bottom slider to quickly change the date and time. [E] Slider: set the date and time by going back and forth. I-TASSER (http://zhanglab.ccmb.med.umich.edu/I-TASSER/) is a popular protein structure prediction software that can also be installed locally as a stand alone program. The setup is comparatively straight-forward (or at least similar confusing as other systems such as Torque or SLURM) and the necessary binaries are available through Ubuntu's repositories. After successful setup of SGE and some tests, I was ready to setup I-TASSER to use SGE. It's advisable to run I-TASSER in the serial mode first, to check that everything is in order, e.g. the database is in the right place, all the right software is installed etc. If the serial mode works, we're ready to change the starting script such that it works using SGE. The starting script is called runI-TASSER.pl and located in the I-TASSERmod folder. I made a copy of this script and called it runI-TASSER_SGE.pl. This seems to do the trick. You can now use runI-TASSER_SGE.pl using the -runstyle parallel option and I-TASSER will submit the tasks to the SGE queue.